I went on a family vacation. My garden was still producing but not a whole lot. So, I didn’t expect much. I was in for a surprise! While I was away, my cucumbers decided to play! 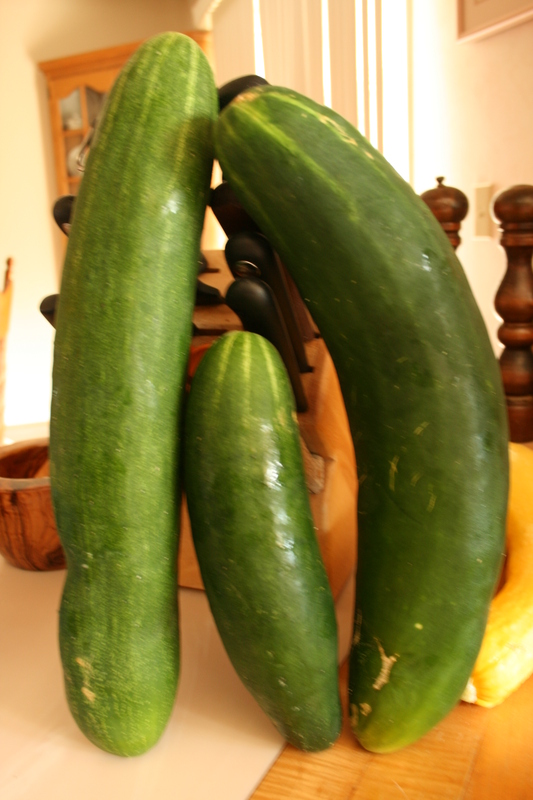 There were 5 cukes that were 14 inches long and almost 3 inches in diameter. Really, look at the size of them — dwarfing my 5 quart mixer and towering over my salt and pepper grinders! My cukes grew huge while I was on vaca. When I cut into them, I expected dry centers and mealy flesh but these were oh so sweet! I couldn’t believe it! One cucumber was enough for dinner for two adults. But the cukes weren’t the only veggies to go berserk! My pole beans grew up and over the 8 foot fence section I put in place for them. And then they kept on growing. I didn’t have pole beans; I had a green bean jungle! 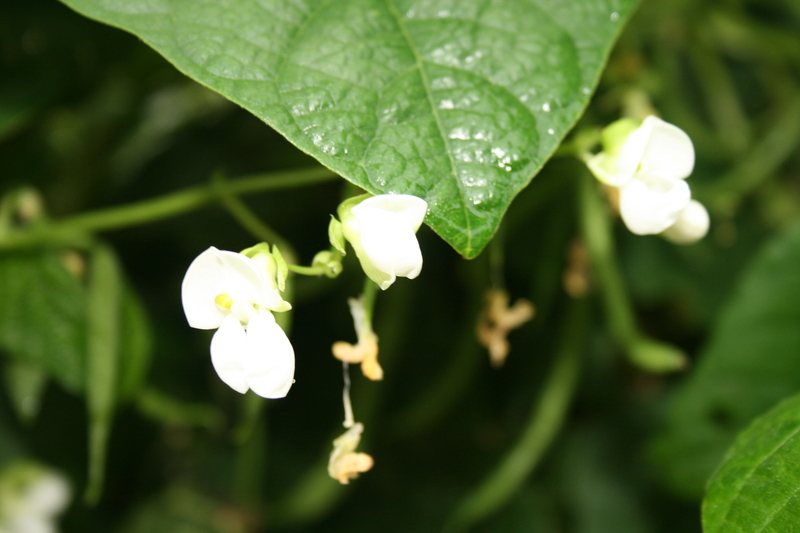 The pole beans created a green bean jungle. I could not believe how dense the growth was. 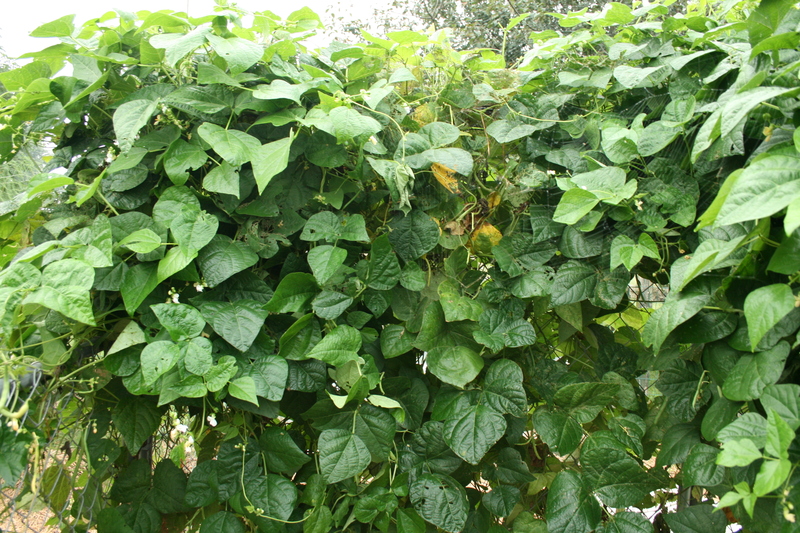 The vines twisted, turned and knotted themselves together to form a mat of green bean greenery that could not be penetrated! making them into green bean slaw and eating them raw. I love green beans but I already have 32 quarts canned and in the pantry. And I think if another green bean hits my husband’s plate, he may just divorce me! And I’m still picking cucumbers! What a whacky gardening year this has been. Anyone interested in learning more about organic gardening? My book — Grow So Easy; Organic Gardening for the Rest of Us is available on Kindle! I’ve gotten some good reviews and would love to know what you folks think!